As the old saying goes – if you can’t get somewhere on the 576 bus it ain’t worth going. 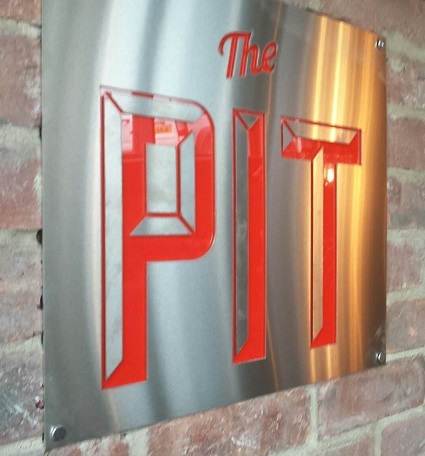 However, we were recently invited to the soft launch of The Pit in Harrogate and quite fancied an afternoon on the piss pretending we’re posher than we are, so headed over. Disembarking from the train we were surprised, but comforted, by the sight of a Dixy Chicken in the near distance. If lunch went pear-shaped, we wouldn’t go hungry. Once we’d stopped laughing at the people queueing to get in at Betty’s Tea Rooms and picked ourselves up off the floor, we found The Pit over from Major Tom’s Social (good beers) and next to Jamie’s Italian (ta for the wifi, J). You know that joint Frank visits for ribs in House of Cards? 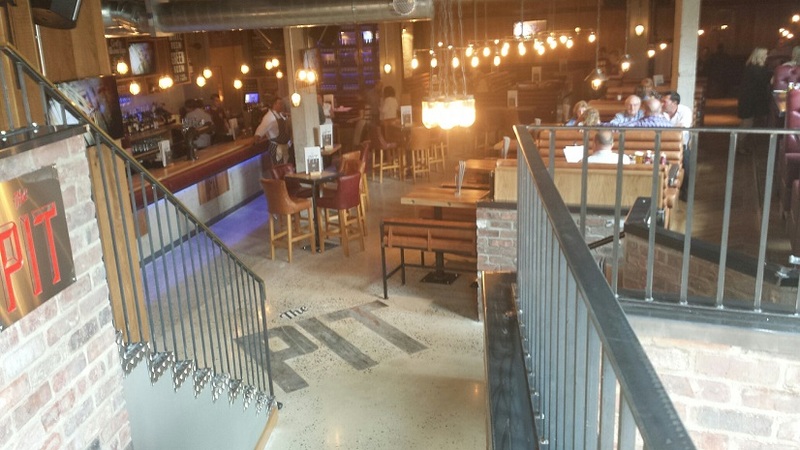 Well The Pit’s the opposite of that; a big, bare-bulbed Brewdog-bar of a place. Granted that’s de rigueur, and we like it, but it’ll probably look even better once it’s been worn in and scuffed up a bit. 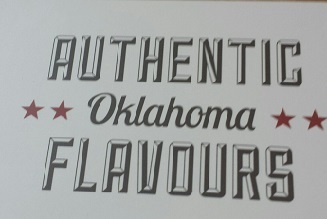 Now in the interests of full disclosure we should declare that we’ve never actually been to Oklahoma, nor have we seen the film, so we’d have to take The Pit’s word for it that we’d be tucking into some “authentic Oklahoma flavours”. 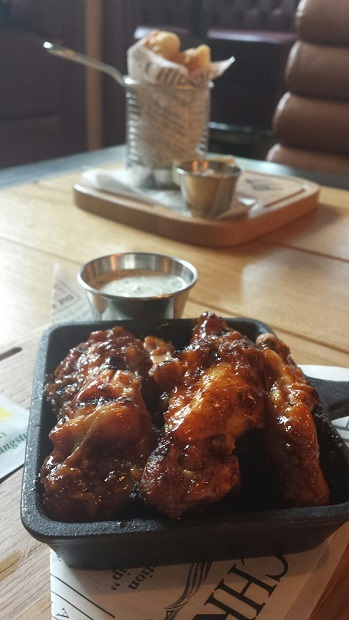 The chicken wings warranted nods of approval given how tender they were, and the sauce they came in meant the napkin got a good workout. 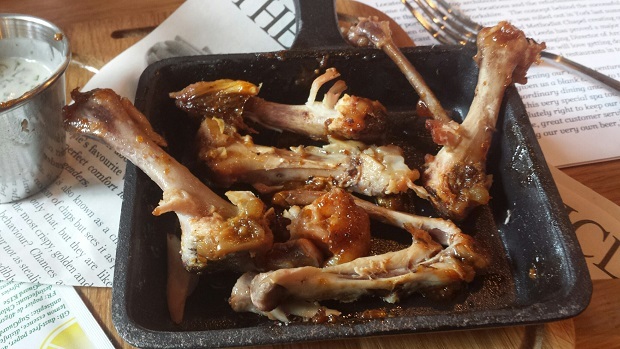 They come with either ‘hot’ or ‘not’ sauce, and the hot that we went with could probably do with some more punch. Then again, we do like a bit of raw scotch bonnet on our shreddies, so maybe it’s just us and our knackered old tastebuds. 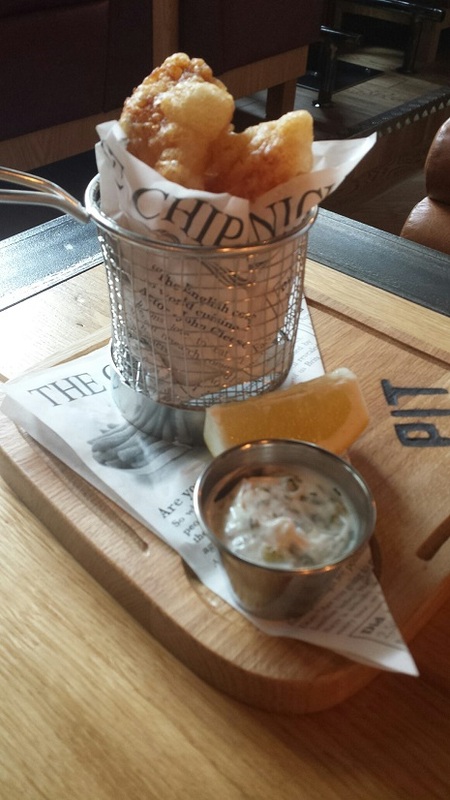 Shrimp, cod and squid came in a clean, crisp batter for the Seafood Catch and were helped along with a dill pickle mayo which is Harrogate speak for tartare sauce. There was a bit of chew with the squid, but the prawn and fish were good. 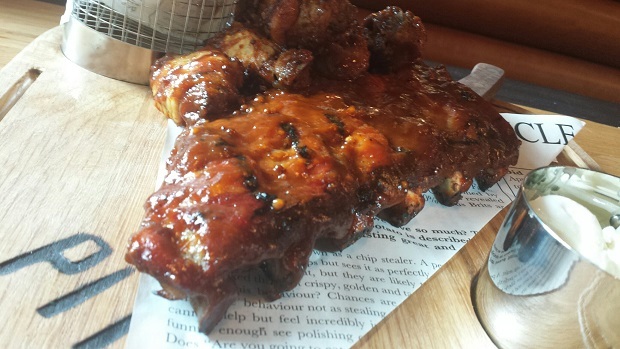 The Pit came into its own with the mains, though, and the ribs of the “ribs and wings combo” (£16.95) were apparently the best the scoffer had ever scoffed. He said they were soft and he said they weren’t too sweet and he said a lot, actually, but didn’t let me judge for myself. Tight Blackpool b*stard. 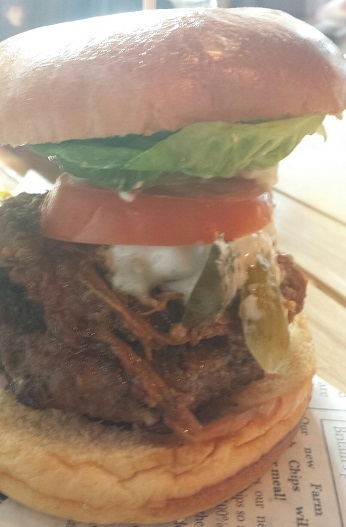 The Black and Blue burger (£13.50) was full of big beefy flavour which was helped along with slow-cooked, melty brisket that would rightfully have its own place on the menu. The creamy blue cheese, of which there was just enough, sharpened everything up nicely. Brioche bun: tick. 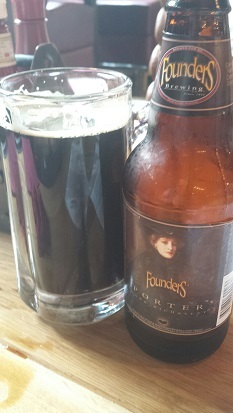 A bottle of Founders Porter went brilliantly with this. Total fluke on our part. The burgers do cost a pretty penny, and if we’d have been paying, we’d have liked ours a shade pinker. 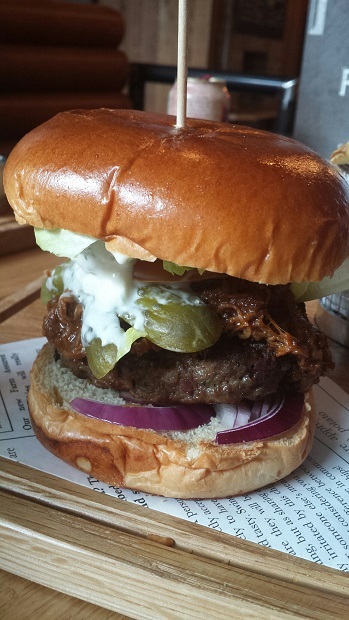 That said it was one of beefiest burgers we’ve had and we could both testify to that because I shared some of mine. Unlike some. Service was fast, friendly and full of vim. Yep, we’d been invited and it was free but this was a long way from the 576 route so if it hadn’t been worth it we’d say. The train did cost a tenner, after all.